Now that the holidays are over, it’s time for me to get back to business on a few things, one of them being writing (yay! ), and I’m not just talking about bloggin’! The three magazine articles which I’ve already gotten assignments for are calling me, and (I’m putting it out in the universe not as a resolution but as a commitment) I plan to send off several queries to some new magazines by this Monday. 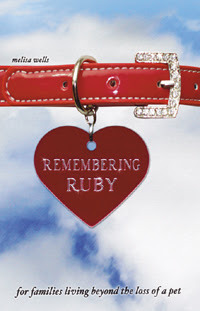 The other piece of “business” I need to get back to is promoting my book, Remembering Ruby: For Families Living Beyond the Loss of a Pet. Many of you knew me from my other blog first, but I think some of you might not know about it, so I’m plugging it on this blog (finally!) and asking for some help. The book is, as you will hopefully guess from the title, about losing a family pet. You can check out my other blog for lots of information about it, including parts of the publishing process, essays about the real Ruby (our late beagle Bijoux), and some of the “ink” I’ve gotten. In fact, I just posted a brand new article today from the newspaper in Tennessee where I went to school. 1. The story, though naturally sad in parts because of the subject, ends on an uplifting note because the overall theme is coping and moving on with life as a family after a loss. 2. I used real photos (in black and white) from our family rather than an illustrator. There were several reasons for this strategy, and I’ve been pleased with the feedback: I’ve been told that the photos make the story more “real” and “relatable”. 3. The book is mostly made up of the story itself, but contains (at the back) a short parent guide on helping kids cope with loss. I do not get into any psychological advice because I am not a doctor, but I offer some suggestions on family activities and such. Our long-time veterinarian had some input into this part of the book. 4. The book is mainly geared towards ages 4-10, but it is truly a story for all ages. 6. The book is only available online and not in stores. The most popular places to find it would be Amazon.com and BarnesandNoble.com. Here’s where I ask for help. As I am not with a major publishing house and I am definitely not an author as anticipated as, say J.K. Rowling, Stephen King, or Ernest Hemingway (may he rest in peace), I have to promote this book on my own. 1. Obviously Number One would have to be: BUY MY BOOK. Did I have to say that??? 3. If you do buy my book through Amazon, PLEASE leave a review. (Only if you like it, though! LOL) My most recent review came from Rob, and it is quite a masterpiece. You don’t have to be eloquent or anything like that; if you liked the book, it’d be great if you just said that! 4. Keep my book in the back of your head, in the corner of your brain. Unfortunately, pet loss is a huge part of life today, as so many people have brought those furry (and sometimes feathery, scaley, or whatever) friends into their homes. The book makes a great gift. If you need any more information, e-mail me! It’s easy: just click the link that says “E-mail Me!” over there on the right. Plugs that are shameless are my favorite. YAY for this post and plug! You forgot to mention that when they hold the book up to their ear and possibly hear me sobbing from my dealing with the publishing process, that I also whisper the winning lottery numbers! Gotta agree with your sister. Yay to this post and plug. You truly deserve it. Yes, shameless plugs are always the best! As Kay said…you deserve it! hey…i have a real question…my cat died in october and my 4 year old is still asking when she is coming home. does your book deal with how to answer him? because, he is still convinced that she is at the vet and when she gets better she’ll get “undead”…kinda stephen king-ish but, that’s what he truly, in his heart, believes. so, if your book can help me explain it to him…i’m buying it!!!! Wow, I went to bed at 12:30 and apparently had an explosion of visitors overnight! Kat & Taj: Thank you! I’ll do my best to mention it around to my buddies. Let’s hope this is a big year for you and Remebering Ruby. And though I am not in the business of pimping out my sister for makeout sessions, she did (on her blog) offer to make out with people who bought the book, right? (or was it just the Transit Map book? I can’t remember.) Regardless, Julie thanks you also and maybe the two of you can work something out. ROFLMAO! As you may have noticed, I’m horrible at remembering to post things (like the meme I got tagged with! Darn!!) But I will for sure post something on my blog. Do you have a graphic that I can steal for my sidebar? Hey, if you want, give me an html button/link and I”ll put it on my sidebar as an advertisement. lol, Melisa! Though I thing Jules is a really nice girl and all, well, she’s just not my type, you know, the girl thing and all. Now get the girl a pair of hot pants and maybe we’ll talk (gotta read my blog to get that one). Me too on the html button..I swiped the one from Jules site today but didn’t have the time to fiddle with it. Care to share? Mags, I e-mailed you the .jpg of the cover. If anyone else wants it, just e-mail me! Andie and Melissa: I will send you the html code for your blog. Again, if anyone else wants it, let me know! Thanks so much…I really, really appreciate you guys and your enthusiasm! hey…i’ll post a little widget thingy on my blog, too! Thanks SSP/Mel: I e-mailed you!